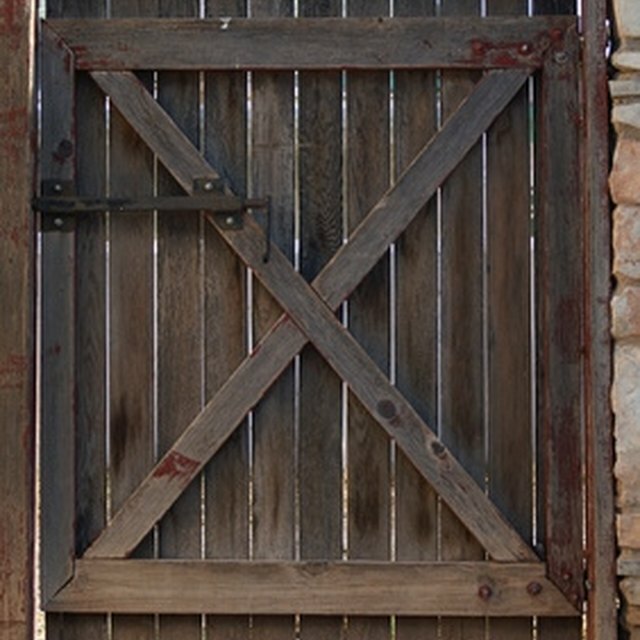 You can keep unwanted critters out of your backyard and children and pets in by installing a wood gate lock. Extremely affordable, an automatic lock, also known as a gravity lock, can be added to your gate and fence in less than 15 minutes. With an automatic lock you can open and close the gate with one hand and have it lock behind you. You need no experience to install a gate lock. Remove the lock from its packaging and hold it up to the fence roughly two inches down from the top. The arm of the lock should be aligned with the movable gate, and the anchor portion of the lock should be resting against your fence post. Holding the lock still, use a pencil to make a mark in each of the screw holes. These marks will keep your lock aligned as you work. Set the arm of the lock to aside and begin attaching the anchor portion by screwing through the lock holes and into the fence post. Tighten the screws enough that the lock will hold and not shift. Place the arm of the lock back in its position on the gate following the pencil marks. Screw through the holes and into the gate. Again, tighten the screws enough that they will hold and not allow the arm to move. Check the alignment of the anchor and arm by opening and closing it repeatedly. The lock should be easy to open and easy to close. If you have to use force for either motion, then readjust the position of the arm until it is an easy movement. Once the lock is corrected aligned, retighten all screws securely. Make sure your lock is sitting at a comfortable height. With the exception of small children, all members of the family need to be able to reach the lock from both sides. Most gates can start to sag over time and with much use. Consider purchasing an anti-sag kit to prevent this from happening and lengthen the life of your gate. Anti-sag kits can be purchased online or at hardware and do-it-yourself stores such as Lowes and Home Depot (see Additional Resources). How do I Install a Remote Control Chain Link Gate?